So... .let's take a look at this storm a little closer in case you missed it. 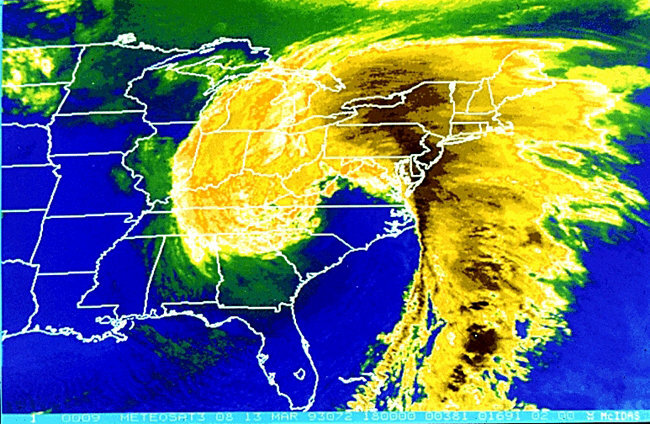 On March 12–14, 1993, a massive storm system bore down on nearly half of the U.S. population. Causing approximately $5.5 billion in damages ($9.8 billion in 2019 dollars), America’s “Storm of the Century,” as it would become known, swept from the Deep South all the way up the East Coast. Before the monster storm system developed over the East, it spun up over Texas, bringing damaging winds and hail to southeastern areas of the Lone Star state the evening of March 11. With a central pressure usually found only in Category 3 hurricanes, the storm spawned tornadoes and left coastal flooding, crippling snow, and bone-chilling cold in its wake. Of the more than 200 weather and climate events with damages exceeding $1 billion since 1980, this storm remains the country’s most costly winter storm to date. Over the south, Birmingham received more than a foot of snow, the Atlanta airport received 4.5", while the northern suburbs received more than 10". The Atlanta NWS reported "Total snowfall by late evening averaged 18 to 24 inches from Rome to Clayton with near 30 inches from Fannin to Union Counties. Snow drifts up to 10 feet high were reported". I had around 10" at my house in Dacula, but it was hard to measure since the wind blew it around so much. Lake Lure, NC 18 in. Siler City, NC 1.5 in. 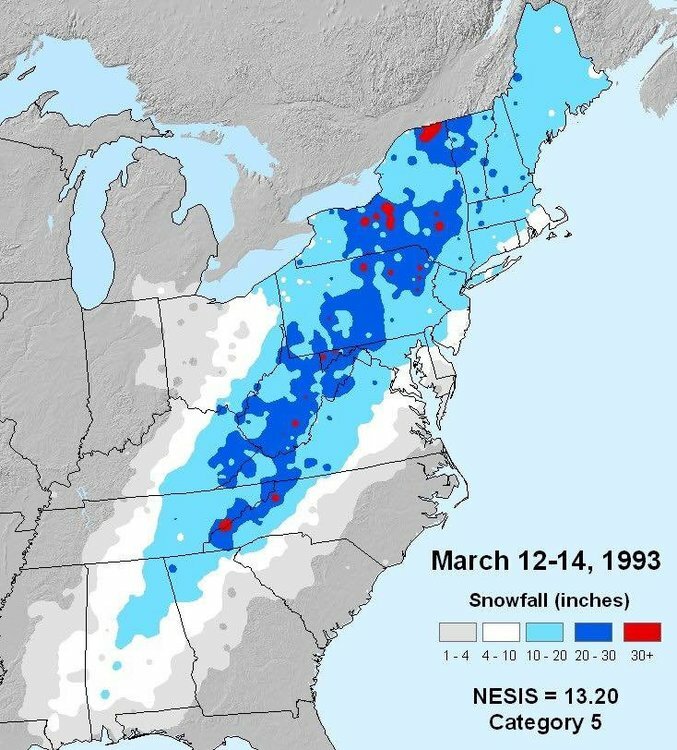 In 1993, the 'Storm of the Century' produced record amounts of snow across north Georgia. Wind gusts near 65 mph across extreme north Georgia produced blizzard conditions as visibilities dropped to zero in many areas. Total snowfall by late evening averaged 18 to 24 inches from Rome to Clayton with near 30 inches from Fannin to Union Counties. Snow drifts up to 10 feet high were reported. In Murray, Whitfield and Gordon Counties in northwest Georgia, damage estimates to businesses and homes were over $300 million. Over 120 carpet businesses in northwest Georgia were destroyed or damaged from high wind or the weight of heavy snow. Over 90 chicken houses were destroyed in north Georgia killing at least 1.3 million chickens. Thousands of trees were uprooted with damage costs of wood products and cleanup estimated at $5 to $10 million. Travel across extreme north Georgia, especially along the I-75 corridor, was brought to a standstill for up to a week following the blizzard conditions. The impacts of the storm went far beyond the snow totals, with tornadoes, extreme winds, storm surge, and record cold. All in all, 318 people died as a result of the storm. The development of the storm shows how the perfect setup brought the perfect storm.